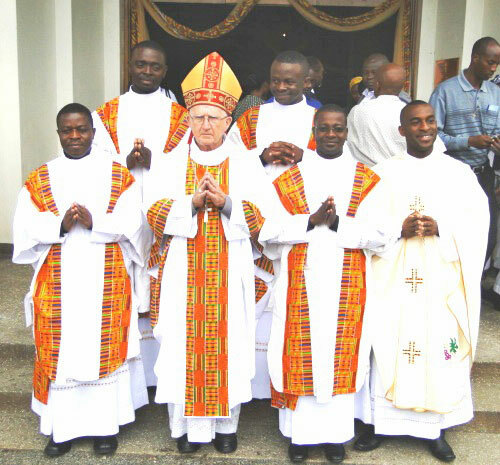 Rt Rev Noel O’Regan SMA (Cork City), Bishop-emeritus of Ndola, Zambia, ordained four SMA deacons and one priest on 21 May at the SMA House of Studies, Nairobi. Normally our priests are ordained in their home countries but, due to the uncertain situation in Ivory Coast, it was decided that Rev Phillipe M’Boua be ordained to the priesthood by Bishop O’Regan. We wish Fr Phillipe and our new Deacons every blessing in their ministry. Our picture shows them after the Ordination ceremony. Front row, left to right: Simon Assogba (from Benin Republic), Bishop O’Regan, Augustin Kassa (Togo) and Fr Philippe M’Boua. Back row: Matthew Shinkut (Nigeria) and Charles Koudje (Central African Republic).